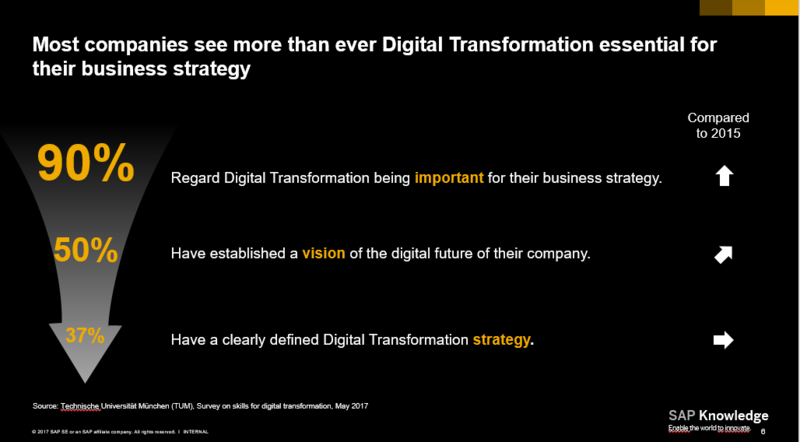 For many businesses digital transformation is on top of their priority list. However, many still need to define a strategy to equip their employees with the right digital skills to be successful on this journey. This is also a key finding from research by Technical University of Munich (TUM). Published in June this year, TUM’s study “Skills for Digital Transformation” reveals that awareness of the importance of digital skills is greater than ever. However, targeted skill development is still rather the exception. In fact, digital talent is threatening to become the major bottleneck of digitization in the industry. Perhaps the most striking finding of the study is that despite the growing awareness and enthusiasm for digital transformation, companies may be missing out on building the right digital skills. In 2015, 53 percent of the respondents claimed that their company does not have the personnel with the skills necessary for digital transformation. In 2017, this number even increased to 64 percent. Possible explanations are the increasing speed of technological innovation and the growing awareness of the importance of digital skills. Despite this awareness, little more than the early adopters (16%) of the companies in this study however invests into dedicated programs to build up the skill base needed for its digital future. The respondents in the survey seem to have a clear perception of which skills they need. The top runners among the 14 key skills are digital security, mobile technologies, business change management, and big data analytics. 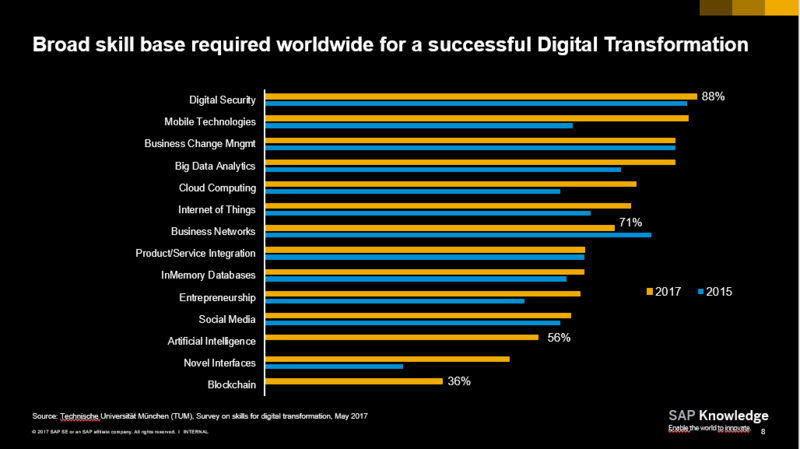 Respondents considered most of these required skills for successful digital transformation to be even more important now than two years ago. The respondents however reported a substantial skill gap in all skill domains. In collaboration with the European Research Center for Information Systems (ERCIS), SAP SE is currently identifying best practices as part of a maturity model for how companies can develop the skills for digital transformation. Details on this maturity model and identified best practices will be available later this year. More information about the two studies will be shared in a webinar on September 14, 2017. To read the complete IDT study and learn more about its findings, visit the website of the Technical University of Munich. You may want to register for SAP Learning Hub for free – simply register with SAP Learning Hub, discovery edition, the trial environment for our on-demand learning solution. This edition provides for free access to several materials to build skills relevant for the digital era. Registration is free and easy: all you need is a valid email address. What are your challenges with regards to building up skills for digital transformation? Feel free to join this discussion and share your point of view. First – thanks for an interesting and timely blog. Only 116 people from 18 countries is not really a good representative of digital transformation. The survey was for a limited type of business. (See the survey link for more information) I didn’t see the size of the companies either. Who took the survey – it looks like most of the time it was the business leaders. After typing that I agree – we always need to keep up with training to get to the next level. However, it could be upper management itself that hinders the process. Not understanding the need for digital transformation. Not hiring enough IT personal. Relying on only consultants or only internal resources. This is just too big to do with one group. Breaking it down! It can’t be done all at once it would create chaos. My thought – it’s just too dang hard to change the entire company. So we need to do it in small bite sized pieces. We need to learn more ourselves and work on a sales pitch to upper management. The project will not be cheap. As for the blocked because of lack of skill set. I would say that each of us is responsible for learning the new skills. I also think there will be a market for older technology as well. The back end in all of this must be maintained. Reimagining the Future A Journey Through the Looking Glass – Some of it seems like sci-fiction to me. But think of where we were 10 years ago or even 5. What we are doing is sci-fiction back then. Well said! I have recently been researching a model for CPD based on “micro credentials”. Essentially this means that learners can choose what to learn, where and how. What they have learned is then peer reviewed before any certification is awarded. This avoids people collecting certificates simply for attending courses which companies have paid for but don’t benefit from. It sounds disruptive which could be a sales pitch . OpenSAP is indeed a fabulous resource which SAP should be very proud of. as I coordinated the skill for digital transformation study mentioned in the blog, Bernd asked me to reply to your feedback. Thank you very much for sharing your ideas and model based on “micro credentials”. I found in particular your concept that peers review what a learner has learned before any certification is awarded quite interesting. Usually peer review is known in the academic world for quality control as papers or articles published in a peer-reviewed journal are closely examined by other reviewers who are experts on the topic. Applying this quality control principle to review what a learner has learned is rather new and thought-provoking. Thanks for providing this food for thought. as I coordinated the skill for digital transformation study Bernd asked me to reply to your feedback. Thank you very much for your comments and your thoughtful considerations. I appreciate very much your view about skill development for digital transformation and in particular the role management needs to play for the transformation journey. Without the knowledge to identify digital opportunities and without an “upskilled” workforce to implement the strategies, businesses will struggle to create and execute effective digital strategies. All levels of employees require new skills, including managers, business owners, and business workers. Today, business leaders must become technologically literate to create a digital strategy and vision. On one hand management needs to be sort of a role model when it comes to developing digital skills while inspiring and facilitating the upskilling of the entire workforce. On the other hand management needs to develop new ways to put employees in charge of the learning experience. Firms must shift from a “push” to a learner-centric employee “pull” approach to learning. Employees have to take responsibility for developing their skills continuously over the course of their careers. As Bernd mentioned in his blog we’re currently identifying best practices together with the European Research Center for Information Systems as part of a maturity model for how companies can develop the skills for digital transformation. In your comment, you addressed the change management part of the digital transformation. The maturity model will also emphasize to define a Digital Transformation strategy that specifically contains the vision, planning, and implementation of the organizational change process. Details on this maturity model and identified best practices will be available later this year. If you’re interested in there is another very recent study also dealing with the importance of skill development: http://sloanreview.mit.edu/projects/achieving-digital-maturity/ . The study from MIT and Deloitte claim that organizations that don’t develop their talent are likely to see employees and executives jump ship to competitors that do. They argue that companies need to make their organization a talent magnet that recruits, retains, and develops staff with digital skills. Once again thanks for your thoughts on this important topic and your recommendations on openSAP courses! Thank you for the reply. And a HUGE thank you for the extra reading material. It even gave some use cases – companies that had or were in the process of digital change. Some of the things – I had to shake my head at and smile. “Breaking down functional silos and focusing on cross-functional collaboration is considered crucial to success in digital environments.” That statement could be heard a long time ago. I believe when ERP systems started coming out. And even saying that, it must be the hardest thing in the world to do…. Because I don’t think I’ve worked anywhere that achieved this. The silos are still up and hopefully with cracks in them. As for learning new things — I always enjoy it! I can’t wait for the next steps.